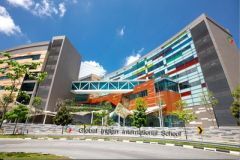 SINGAPORE, July 10, 2018 - (Media OutReach) - The Global Indian International School opened its flagship SMART Campus, the largest smart school in the world, to provide NextGen education for 21st century learning with most technologically advanced facilities. The 10 acre (3.50 hectares) has unparalleled security systems in place including facial recognition facility - a highly efficient means through which students will be able to access the entire campus. "The SMART Campus is the only international school in the world to use this facial recognition feature on such a wide scale deploying over 170 facial readers across the campus," said Mr Atul Temurnikar, Chairman and Co-founder of GIIS. "The idea was to ensure that our students get maximum security in a safe, conducive environment within the campus," he said. GIIS' mission is to nurture young minds into global leaders and innovators through its proprietary 9 GEMS(TM) methodology, a holistic approach to teaching that balances academics with sports, performing arts, entrepreneurship and character development. GIIS is a member of the Global Schools Foundation (GSF). Based on high standards of governance and established academic criteria, GSF has consistently been recognised internationally for excellence in education, and has received more than 100 awards over the past 15 years.